We had a very wild, wet and windy weekend, and it doesn't look much different today, although the sun is trying to come through. I visited a friend on Saturday, and after taking the tram to the centre of Düsseldorf, decided to walk the rest of the way, over the bridge, which was a mistake. It was so windy I had to hold onto the railing with one hand and my cap with the other one, so was happy to get to the other side in one piece, although I was not able to take my usual photos. But I was rewarded with some wonderful food and hot coffee when I arrived, so that was good. Hope to see lots of you joining in the challenge. Oh my! Your Tuesday tag is scrumptious!!! Using one of your gorgeous photos as a backdrop turned out fantastically! Love the idea of the glass slides...so cool. Your photos always catch the beauty around you and the mood of the weather. I like mushrooms and toadstools and love your tag featuring them :) You got great photos of the clouds! I love to see all the flowers, and I'd have come away from that market with something I'm sure -just to tide me over 'til Spring arrives here :) Happy early T Day. Your walk across the bridge was quite the adventure, glad you made it across! Lovely mushroom tag. Always love to see those little snowdrops. We are awaiting a winter storm tomorrow. Wow those strong winds sounds so scary-I never liked wind one of my least favorite of nature's elements. Hope your doctor appts go well. That is an interesting topic for you all-love what you created with the mushrooms. I am surprised that the spring bulbs are blooming already-is that early for your area? we have had crazy weather too I should check on my daffodils. This is about normal time for the first spring bulbs. Your tag is very cute. I love the red toadstools. The coffee page made me laugh. So you. Nice to see signs of Spring even though the skies look so threatening. Won't have Spring flowers here for another 2 months. the glass sides are so cool. Your cup of coffee must have been so welcome after the rainy, blustery walk. Stay warm and dry! Happy T Day! 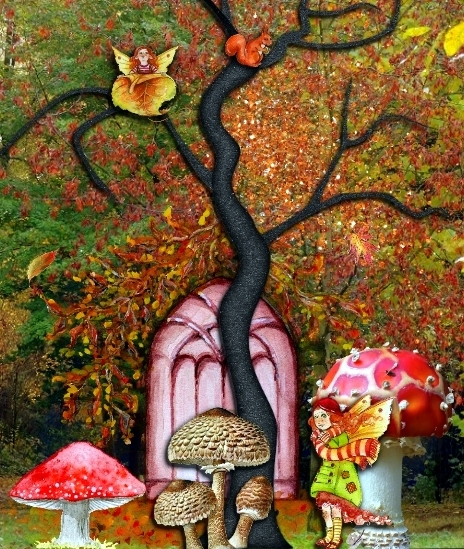 Its a wonderful fantasy tag and I would have thought autumn as well, the colours you used are lovely. Your coffee T day themed page looks fantastic as well. It must have been awful crossing the bridge in the high winds the skies looked angry in the photos you shared. The slide exhibition looks great, it must take a long time to look at them all. Happy T day wishes Valerie and I hope your appointments this week go well. LLLLLLLLOVELY tag, Valerie!!!!!!!!!! And I love your photos with the sky!!!!!!!!!! Hugs, my dear friend. Wow! So much to look at! Gorgeous art and photos Valerie! Always nice to see your photographs. Hoping all your doctor's appointments go well. Dein herbstliches Tag mit den schönen Pilzen und Elfen mag ich sehr. Aber auch die Kaffee Komposition mit dem schönen gemalten Gesicht gefällt mit gut. Auch die Fotos sind wieder sehr stimmungsvoll geworden und vielfältig dazu. Love the mushroom tag. I love mushrooms- to eat, and those I find out on walks:) The weather sure does look cold but oh my, to see the beautiful flowers is such a treat during the winter months. The slide show art is so impressive- wow! Good luck with your appointments, and happy T day! Several beautiful tags! The fungi tag is my favorite though. It must be the mushrooms. Some very lovely photos. The flowers at market look like the most lovely place to visit. I would love to visit such a place right now especially with the snow that is falling. ein toller post heute,schöne seiten und dein elfenwaldtag gefällt mir besonders gut. ich war gestern auch nach langer zeit mal spazieren,die sonne war schön, nur bißchen kalt ist es noch. bei mir ist schon wieder polypöses gewebe in der nase,eine probe wurde eingeschickt,bitte drück die daumen das es gutartig ist,es sieht gut aus,aber zur sicherheit wurde die probe entnommen. Ich denk an dich Jenny! My sincere apologies for not getting here sooner. I've been very worried about you because I hope they get whatever ails you figured out. I would have been here sooner, but I decided to eat, which included about a gallon of ice cream, then promptly fell asleep. 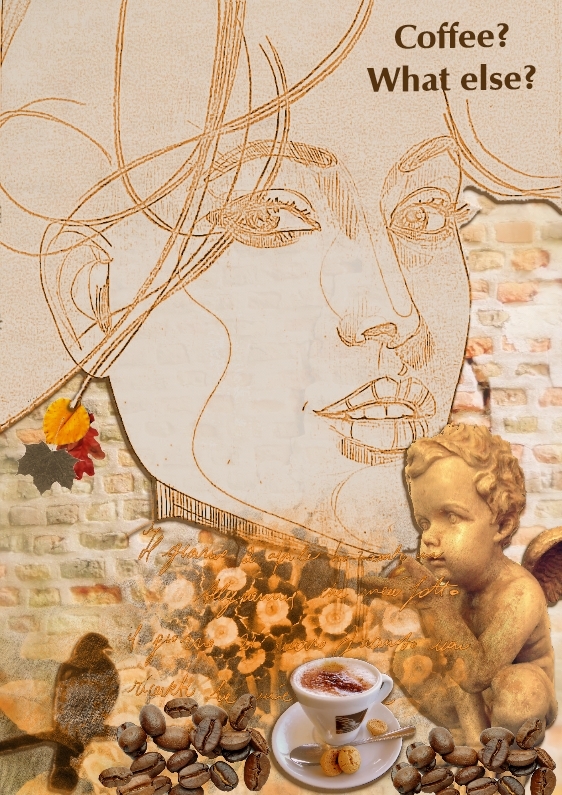 Just woke in time to make coffee and fall in love all over again with your lovely coffee inspired art you created for us for T this Tuesday. LOVE the photos, but they all look so cold. Those tulips were fabulous. Thanks for joining T this Tuesday and good luck finding answers at the next doctor's appointment. 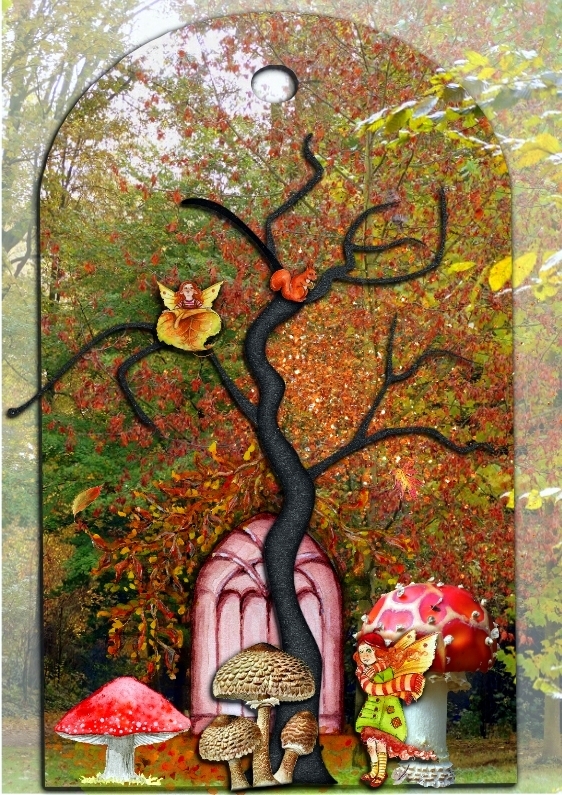 Love that you used a curved tag for your fungus fantasy, it mimics the theme very well rounding it all off beautifully. Love those little hidden extra's reminds me of a children's fairytale. We've had strong winds over here but they only lasted a day or two thankfully. I love how the students artwork has been displayed, an uplifting way to rejoice in those artists and brighten up a dark area. Wishing you all the best with your Doctors appointments this week, hope those answers you are looking for come soon. Beautiful art and photos, I love your mushroom tag. I hope your visits to the doctors go well. Fabulous tag Valerie, love all the different elements. Great photos, Your flowers look about the same as ours, as we are the highest village in Herefordshire and catch the cold winds. Hope your health gets sorted ASAP. Great mix of photos and artwork. Happy T-Day! So many wonders today. I love the fairyland tag. Purrfect. And the coffee of course piece. Heh. Drinking mine now. Very cute tag, Valerie. I love your coffee themed collage. I wonder if you drew the lovely face. Good luck with your upcoming doctors' appointments. I continue to be amazed at all the "spring" bulbs already popping their heads us in the midst of such gray and cold weather. When I lived i n New jersey and Wisconin, the bulbs didn't come up until mid-March. Wow - an art installation in a subway tunnel. It's beautiful! Thanks Eileen. I drew the face many years back from an inspiration in a magazine. Good luck with your appointments. Hopefully you won't have to battle the winds again. I love those slides- what a gorgeous and bright sight for travelers. I love your tags, such gorgeous colours. That’s one 5hi g I miss being here in Spain, the spring bulbs, always makes you feel good to know that winter is passing. Your fantasy tag is lovely, but the one with the coffee cup is absolutely great. (Even angels drink coffee apparently). That wind sounded really nasty. I hate the wind, even though I am indoors. So outside it is even worse and you won't get me out in that sort of weather! I love your photos of the angry skies and also of all the flowers that are starting to appear. Spring is coming! I hope your doc's appointments go well and that you get some solutions to your problems. It's definitely been a biting cold winter, but the landscape makes for great photos. Very nice! Love that tag. Your weather sounds wild too. Once again I love seeing all your photos! That picture of the street flower-market looks so cheerful. Just walking by it, would brighten my day. It's a wonderful tag Valerie !! I love it ! Your photography in the background is beautiful, as are all the other details. I also like your pretty page on the coffee, what else? And what about the beautiful photographs that you so kindly share with us, they are impressive !! The beautiful landscapes, the flowers and the beautiful fields, and that exhibition had to be great, Happy T-day !! I wish you a very nice afternoon and send big hugs. Gorgeous tag and photos as always!! Hope all of your doctor visits go well. Thanks for stopping by for a visit!!! Happy Very Late T Day! I love your mushroom tag and your coffee art is so precious! You are so talented! Please keep warm and take care of you, when you go for your walks and when you go to the doctor's too! I love your photos! Those skies are amazing! The door to heaven, wow! Gorgeous flowers! We still have tones of snow! Big Hugs! Weekend post and 2nd on the 2nd.